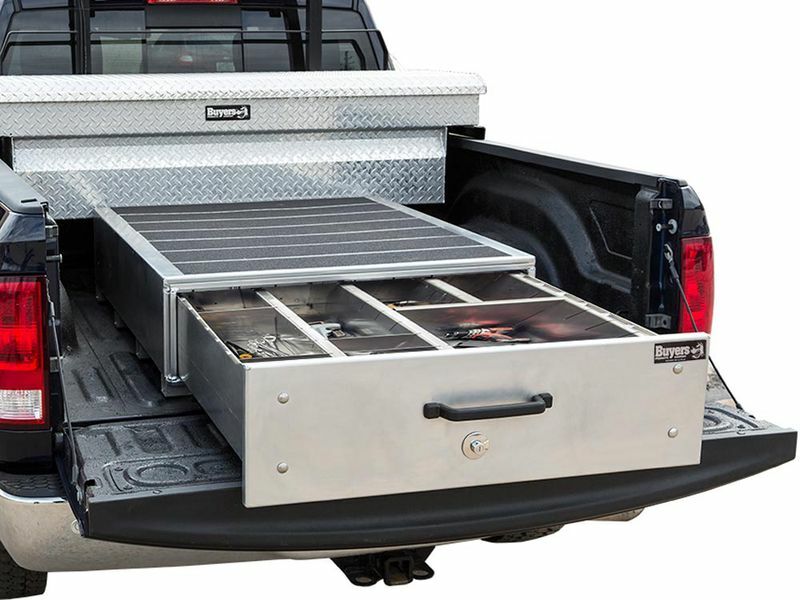 Remove the clutter and organize the items you store in the bed of your truck with the Buyers Slide Out Truck Bed Box. With multiple sizes and colors you can customize it to what best fits your job. Built from corrosion-resistant reinforced aluminum, the Slide Out Truck Bed Box is extremely durable and ready for any job. With its heavy duty construction it is able to support up to 800 lbs evenly distributed across the top and up to 500 lbs in the drawers. To open, push the button and pull the handle. It will lock open every eight inches or push and hold the button in as you pull the handle and it will open all the way. A full door gasket and rain gutter system provide protection from the weather elements from getting inside the storage area. Dividers are included to organize and keep all your tools grouped together. Buyers Slide Out Truck Bed Box has pre-drilled mounting holes to allow you to install the bed box much faster. Drilling is required to complete the installation.